(Nanowerk News) A collaboration between researchers from KEK, the Institute for Basic Science (IBS), the Korea Advanced Institute of Science and Technology (KAIST), RIKEN, and the Japan Synchrotron Radiation Research Institute (JASRI) used the SACLA X-ray free electron laser (XFEL) facility for a real time visualization of the birth of a molecular that occurs via photoinduced formation of a chemical bonds. This achievement was published in the online version of the scientific journal Nature ("Direct observation of bond formation in solution with femtosecond X-ray scattering"). Structure of a gold cyano trimer complex (Au(CN)2-)3. Direct "observation" of the bond making, through a chemical reaction, has been longstanding dream for chemists. However, the distance between atoms is very small, at about 100 picometer, and the bonding is completed very quickly, taking less than one picosecond (ps). Hence, previously, one could only imagine the bond formation between atoms while looking at the chemical reaction progressing in the test-tube. 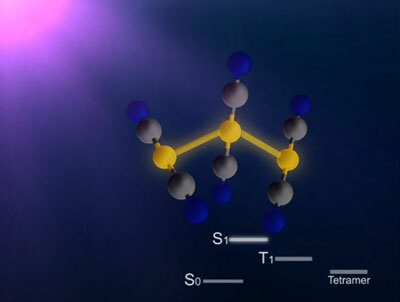 In this study, the research group focused on the process of photoinduced bond formation between gold (Au) ions dissolved in water. In the ground state, Au ions that are weakly bound to each other by an electron affinity and aligned in a bent geometry. Upon a photoexcitation, the S0 state rapidly converts into an excited state where Au-Au covalent bonds are formed among Au ions aligned in a linear geometry. Subsequently, the S1 state transforms to a triplet state in 1.6 ps while accompanying further contraction of Au-Au bonds by 0.1 Å. Later, the T1 state of the trimer converts to a tetramer on nanosecond time scale. Finally, the Au ions returned to their original loosely interacting bent structure. In this research, the direct observation of a very fast chemical reaction, induced by the photo-excitation, was succeeded. Therefore, this method is expected to be a fundamental technology for understanding the light energy conversion reaction. The research group is actively working to apply this method to the development of viable renewable energy resources, such as a photocatalysts for artificial photosynthesis using sunlight.